And so it frakking ends. 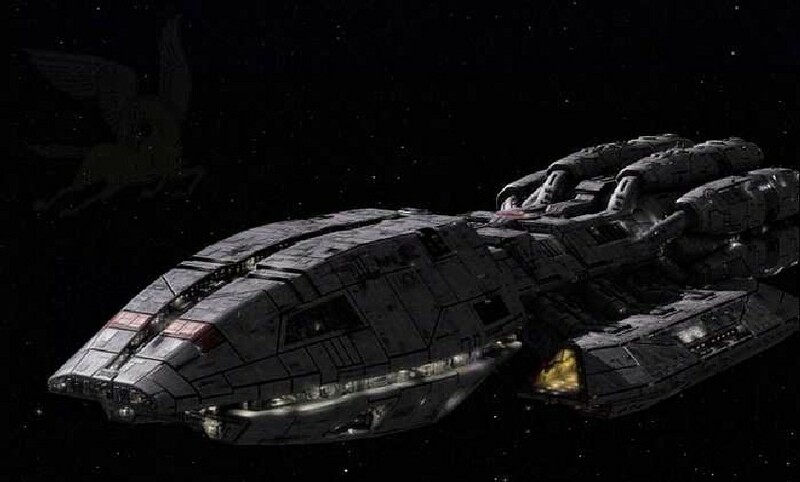 Seven years after Ronald Moore and David Eick transmogrified a cheesy late '70s space opera into a naturalistic speculative-fiction masterpiece, Battlestar Galactica ends with a bang -- literally -- on tonight's series finale, "Daybreak Part Two." We're crying into our octagonal beer steins and wringing our replica Starbuck dog tags in despair, but we're happy that a show that wrestled international terrorism, torture, identity, and every-ism under the sun existed in our lifetime. With that in mind, here's a tribute to the best moments of this four-season opus. The show is so complex (a robot-caused nuclear war, followed by deep space chase, followed by a corrupt election and a robot-human hybrid-God-baby, followed by an Iraq-like invasion followed by finding Earth a post-apocalyptic wasteland) that it's hard to lay out its genius in a listicle. 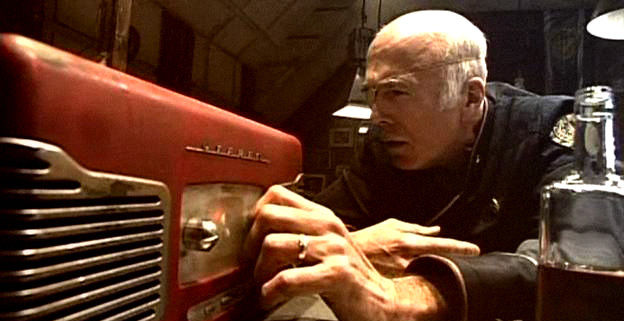 But frak it, we'll try, in a way comprehensible to fanboys and the sci-fi shy alike. 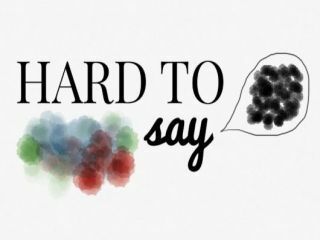 So say we all. 9. Chief Becomes The Man He Wants to Be[vodpod id=ExternalVideo.798446&w=425&h=350&fv=]"We're Cylons," Galen Tyrol - a.k.a. the Chief - says at season three's end, to three members of the Final Five revealed as Cylons. "And we have been from the start." But does Galen turn to robot-mode, abandoning humanity forever? Frak no. And that's why we love him. "We have to be the people we want to be," he says. And as Season Four progresses, what were once moral quandaries become ethical convictions etched in stone, principles for a better way. He knows he's a Cylon. But he's going to keep being Galen Frakkin' Tyrol. Galen's name is identical to that of a famous Renaissance physician who clearly mapped out human anatomy in a rational manner. I believe this to be no coincidence. As Galactica's chief repairman -- and a literal machine himself -- Galen's journey has a special meaning. After figuratively dissecting himself, he doesn't let biology determine his destiny. He's a Cylon, but he's also an ex-husband, a father, a Chief. He is finally the man he always wanted to be. 8. Cylon-Invaded New Caprica: Flipping the 9/11 Script[vodpod id=ExternalVideo.798452&w=425&h=350&fv=]The creators of Battlestar Galactica were recently part of a United Nations panel (yes, you read that right) about the show's grappling with "real-world" issues. One year after the newly elected President Gaius Baltar takes his people to their "New Caprica," a group of Cylons show up to imprison the humans: in order to "win" their love. "This is the only way," say the invaders. "We want peace and harmony -- on our terms." Sound familiar? It should. When the Cylons nuked the human's world, Caprica, the echoes of Al-Qaeda and 9/11 were obvious. Yet by acting as invaders and captors and turning the humans into insurgents doing anything to escape invasion, the show asks us to identify the Cylons -- the enemy! -- as Americans. 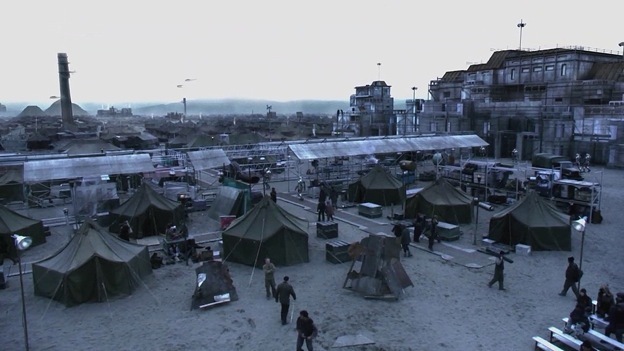 "New Caprica" may as well be New Iraq. BSG's ethical shades of gray are remarkable. The Cylons really, truly believe that imprisoning the humans will "free" them -- that they can somehow create freedom from the top-down. And they sound reasonable when they say so. But once you hear from the horrified humans, it's clear that occupation is no answer, making you question the viability of America's real world colonies. 7. Earth Was a Lie: What the Frak Now? [vodpod id=ExternalVideo.798453&w=425&h=350&fv=]Guided by a vision from their holy Book of Pythia, the thirty-thousand odd remaining survivors Roslin to a vague promise of their original home: Earth. The final episode of Season Four's first part -- "Sometimes A Great Notion" -- showed the ecstatic crew waiting to meet their new old homeworld. Ron Moore has said the show provides the characters with "everything they want," but in the worst possible way. This moment was no exception. The survivors found Earth -- as a post-apocalyptic, nuked-out wasteland. Just like Caprica. "Earth," Roslin says, with the same grit as if she were cursing their Cylon attackers. Everything you want. In the worst possible way. 6. Starbuck's Return[vodpod id=ExternalVideo.798455&w=425&h=350&fv=]Gandalf the Grey becomes Gandalf the White, BSG-style. After we witnessed the death of Kara Thrace via explosion in the latter part of season three, she shows up for the season finale in a newly minted Raptor, to the strains of "All Along the Watchtower," saying she found Earth and would take everyone there. 5. The Ghost Pirate Saul Tigh: "We're the Devil's Men"
We're the devil's men, spreading death and destruction wherever we go. If "Cylon-occupied New Caprica" is a direct Iraq parallel, Saul Tigh is the leader of the band of insurgents. He commands his faithful to commit suicide bombings against Cylons -- an act considered horrendous in our world. Here in New Caprica Tigh's reasoning makes perfect sense. If you were imprisoned by unjust rulers with no options, no freedom, no escape, what would you do? 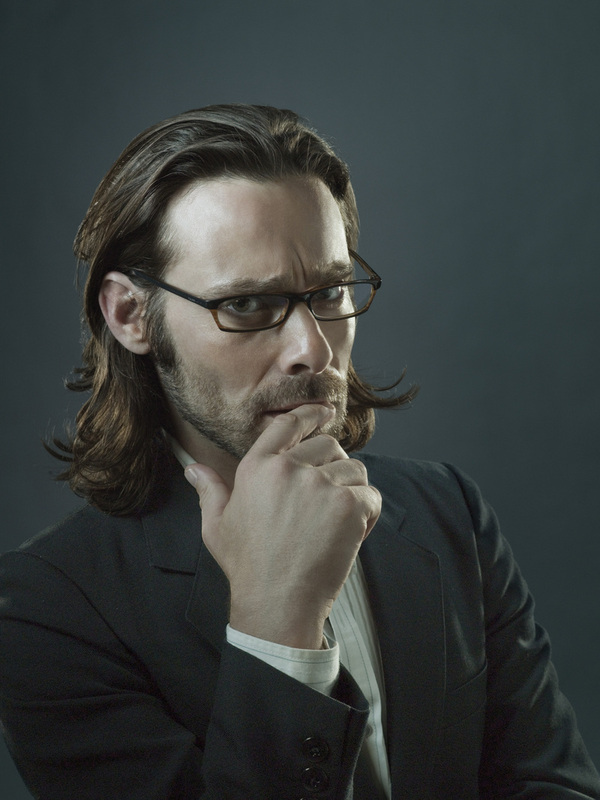 Are there moral justifications for terrorism? What is "right" when it comes to fighting for freedom? Instead of drawing old lines in the sand, Battlestar nukes them, redraws them, turns them into circles, and changes the sand's color entirely. What other program has shown the ambiguities so clearly? This is the Admiral. You've heard the news, you know the mission. You should also know there is only one way that this mission ends: and that's with the successful rescue of our people, off of New Caprica. Look around you. Take a good look at the men and women that stand next to you. Remember their faces, for one day you will tell your children and your grandchildren that you served with such men and women as the universe has never seen. And together, you'll accomplish the feat that will be told and retold down through the ages, and find immortality as only the gods once knew. I'm proud to serve with you. Good hunting. Who'd expect that Saul Tigh's drunkard floozy of a wife -- affectionately titled "Lady MacTigh" by fans -- would turn out to be the fifth Final Fiver and the original architect of eight Cylon models? We sure didn't. We're not surprised that the Tighs have been married for two thousand years. Despite their drunken caterwauling and Ellen's cheating and Tigh's rampant alcoholism, those two have the best love story on the whole damn show. Scratch the surface and BSG is a typical episode of Jerry Springer. With robots. 2. 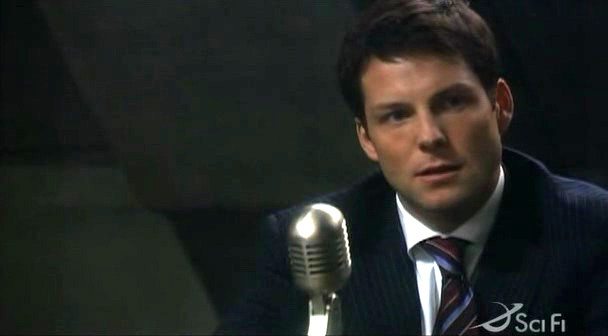 Lee Adama Breaks It Down: "We're a Gang on the Run"
This case, this case is built on emotion, on anger, bitterness, but most of all it's built on shame. It's about the shame of what we did to ourselves back on that planet. It's about the guilt of those of us who ran away, who ran away. And we are trying to dump all of that guilt and all that shame onto one man, and then flush him out the airlock, and just hope that that gets rid of it all. So that we can live with ourselves. But that won't work. That won't work. That's not justice, not to me. Not to me. After Gaius Baltar signed a death warrant on New Caprica -- at gunpoint -- the civilians wanted his head once they had escaped occupation. And heck, they've got a point. But despite hating Gaius' guts, Lee points out that the vestiges of their civilization are gone -- and if Gaius gets the axe, so should everyone else. "We're not the human race, we're a gang on the run," argues Lee in a surprisingly passionate defense of a Saddam-esque Baltar. The younger Adama points out that Laura Roslin rigged an election, that Boomer's twin Athena is forgiven despite, you know, attempting to murder Bill Adama, that everyone's doing what they need to do to get by. To survive. And that sometimes results in terrible acts that would land any person a death sentence in easy times. But these aren't easy times -- this is survival. Gaius walks free, then turns into metaphorical Jesus, then writes a Hitler-like manifesto titled My Triumphs, My Mistakes. Oh, show. After Helo's daughter Hera is kidnapped by Boomer for dissection by the evil Cylons (as opposed to the good Cylons - Season Four has those), Commander Adama appears to have lost the will to fight in last week's "Daybreak, Part One." 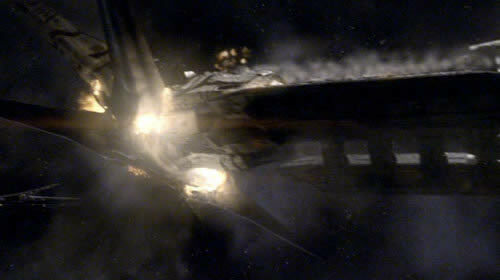 He orders the decommissioning of a crumbled Galactica, which seems unrelated. In this show, however, everything is related. And packing up his boxes, Adama realizes that he's giving up. That his years of survival, of leading his flock, of looking for a home -- will crumble away like Galactica's hull if he doesn't take a stand. And so he draws a line in the ship's bay and calls a volunteer mission to rescue Hera. To take back a child. To stand up to the Cylons once and for all. This wouldn't seem special on such a drama-filled show: but it is, because the fleet is no longer running, escaping, and avoiding - they're going to take the Cylons on, mano a mano. In Season Two, a defiant Boomer is asked why the Cylons nuked Caprica. She answers to the effect of, "Why should humanity survive?" No one ever offered a convincing answer. But this? This is convincing. This is the evidence of humanity's crowning triumph: the urge to do what's right, to rescue a child, even if it means losing the fleet, even if there is no personal gain, even if nothing comes of it. To have the courage to speak truth to power and refuse to accept victimization. To stand up and fight. To refuse cowardice and seek the face of the enemy. I have never been prouder of this show's characters. We'll find out if the fleet survives on tonight's finale. I hope they do. But if not, I will have no doubt that humanity ended with a triumphant bang -- not a whimper. That rallying cry is more than I could ever ask for from series television. Jessica Gold Haralson is a contributor to This Recording. She is a writer living in New York. She tumbles here.